Bartlett’s Surveyors, led by Lieutenant Amiel Weeks Whipple, in charge of the Astronomical Survey, and A. B. Gray, in charge of the topographical survey, began their work in New Mexico, first working on the new International Boundary between the Rio Grande and the Gila River, then surveying the Gila River across Arizona. A Mexican Boundary Commission crew, led by Francisco Jimenez, was also surveying the Gila River at the same time. The American team began the Arizona section of the survey near Safford and worked their way west along the Gila River. 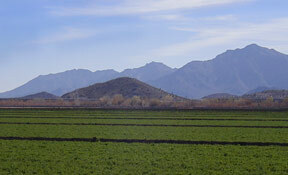 In November of 1851 they were at the Pima Villages south of present-day Phoenix. When they reached the confluence of the Gila and Salt Rivers, Whipple found a monument already built on a hill on the Mexican side by Jimenez’ team. Whipple connected his astronomical survey with this monument. In 1865 this point was chosen as Arizona’s Initial Point. 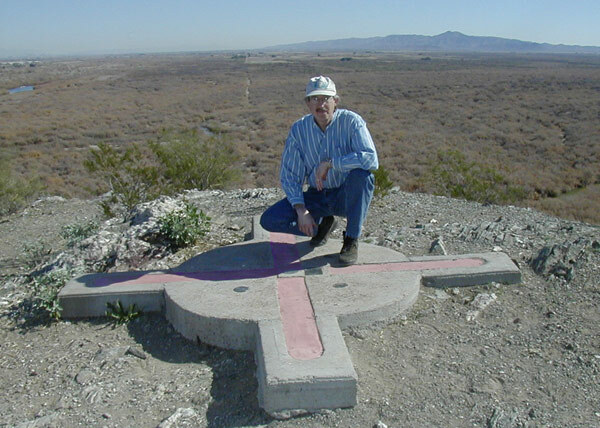 The Initial Point, located on a hill at the north end of the Sierra Estrella Mountains near the confluence of the Salt and Gila Rivers, is the point of reference that most land in Arizona is surveyed from. This hill is now on the grounds of the Phoenix International Raceway. From the Initial Point east and west extends the “Gila and Salt River Baseline” (now the alignment of Baseline Road), and the north-south “Gila and Salt River Meridian” (along 115th Avenue). From this point the land is divided into 6-mile square townships which are subdivided into 36 one-square-mile sections. Each township is identified by its position relative to the initial point, for example the first township northeast of the initial point is “Township 1 North, Range 1 East” or T1N, R1E. The original monument is described as being six feet high and eight feet around at the bottom, tapering to four feet at the top. There was a pole extending 8 feet above that, bringing the total height to fourteen feet. The original monument has long since been destroyed by vandals and was replaced in 1984 by the present concrete one.There are no pictures of the original that I know of but drawings of other contemporary monuments show them often built of local rock on the bottom portion with an ocotillo stalk serving as the upper pole. The modern photograph below shows the monument in January 2002, looking east. The Arizona Initial Point looking east down the baseline.